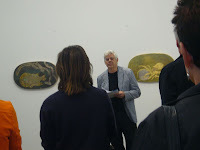 Veteran arts-specialist bookseller Roger Parsons (pic right below ) spoke at the launch of this very special book at Gow Langsford Gallery on Saturday evening. His address follows. It is a longer piece than I would normally pos t to the blog but I found it especially interesting and thought you may too. It is unusual to ask a Bookseller to launch a book. We booksellers are more at ease selling the book from behind the counter, on the phone, via email. Talking about the book to valued customers. It is not our normal role and the request left me in some trepidation. But this particular book, and this particular launch is somewhat different. Here Helen and I find ourselves with people we have known for most of our bookselling careers. Alan Loney has been a customer and publisher/poet from our early days in Victoria Street. Max Gimblett we have known almost as long. Peter Simpson has been a friend and supporter for years. We have sold many books of, and by, these three distinguishes New Zealanders. This invitation provides us with the unusual opportunity to express our admiration and support for these three people who have played an important role in making our specialist type of bookselling possible in New Zealand. Without them the books would not be written, the paintings not documented, and hand printed books unavailable. We are amateurs in such company, with limited skills and knowledge. However, we know enough about the art of the book to know that what they do requires extraordinary tenacity, skill, passion and persistence – often for modest returns. As booksellers and New Zealanders we stand in their debt and salute them. And while I am in the mood, I would also like to acknowledge our hosts for today – John Gow and Gary Langsford – who many years ago combined the unlikely elements of an art gallery and a service station. They have continued for many years to run the two pre-eminent art galleries of Auckland. My first book, written at 13, was in a limited edition of one. Titled “Dams of the Waikato”, it was entirely produced ‘in house’. Hand written and illustrated, and sown with kitchen thread. Linen covered boards, plain end papers and a simple dust jacket. A rough hewn object but my own. It produced only limited acclaim. But the next publication got much more attention. By the time I was 15 the Parsons family owned a lovely Idana hand printing press. This immediately provided the potential for much larger editions. Using old blocks from Wright and Carmen, used in the production of my father’s magazine, “Parsons Packet”, my brothers and I set out to satirize the masters of Rongotai College. It was a simple, stapled, two colour job. There was no formal launch. Our distribution system could best be described as ‘underground’. But joy-oh-joy, the publication met with widespread and instant acclaim. So widespread that very soon we were hauled into the headmaster’s office. No congratulations on the quality of our publication, the excellence of the illustrations, the choice of paper, the balance of words and illustration on the page, the quality of the printing and the writing. No, only instant censure and the destruction of all known copies. We could see this hand printing business might be harder than we thought. Not many people would persist against the odds. But noticeably one person has for many years – Alan Loney. By my count “Fishworks” is Alan Loney’s 25th book and the third collaboration with Max Gimblett – the earlier volumes being “Mondrian’s Flowers” and “Searchings: the Journals of Max Gimblett” which Alan edited. Alan Loney began publishing poetry in the late 1960s. His first book of poems “The Bare Remembrance” was published in 1971 and he printed his first book in 1974. Since then he has developed an international reputation as a poet, critic, writer, publisher and printer. He has been a book and magazine editor – a publisher at Hawk Press (1975-1983), Black Light Press (1987-1991), and the Holloway Press at the University of Auckland (1994-1998). The last couple of years have been amongst Alan’s most productive with three books “Days’ Eye”; “each new book”; “The Printing of a Masterpiece”. All published in 2008. You are indeed fortunate that today you have the opportunity to actually purchase one of his books. Furthermore with the recent closure of Alan’s Electio Editions this could well be his last hand printed volume. “Fishworks is a collaboration between poet/printer and painter. Max Gimblett is well known to this audience and his latest paintings hang on these walls. Max is a New Zealander who has made New York his home for over 35 years. He has exhibited extensively since the mid-1970s with his own work shown internationally in the United States of America, New Zealand, Australia, Japan, Korea, Sweden, Denmark, Switzerland and Spain. And this year he has a major work included in the Guggenheim exhibition “The Third Mind: American Artists Contemplate Asia 1860-1989”. He is represented in New Zealand in by Gow Langsford Gallery. A major monograph on Max Gimblett by Wystan Curnow and John Yau was published in 2002 by Craig Potton Publishing in association with the Gow Langsford Gallery. “Fishworks” originates from a series of unusual ‘fish’ paintings made by Max Gimblett and seen by Alan Loney when he visited New York in 2005. Alan then composed nine poems in response to the paintings. In turn Max counter-responded to the poems by creating a set of nine drawings. The end result is the exquisite book we are celebrating today. It gives me great pleasure to declare “Fishworks” officially launched. For more on Fishworks go here to my earlier post.